UPDATE: News continues to emerge concerning the death of Border Patrol Agent Nicholas Ivie. Current evidence has led Border Patrol Union President George McCubbin to conclude that Ivie was killed after firing on a pair of agents responding to the same tripped sensor. This unusual tragedy highlights just how high tensions are riding on the unsecured Arizona border. Read more. While the Associated Press reports that two men were arrested in a military maneuver in Agua Prieta, Mexico the morning after Agent Ivie's murder, and a police official in the northern Sonora state confirmed the report, the U.S. government, with no further facts, has released a statement that Agent Ivie's death may have been friendly fire. 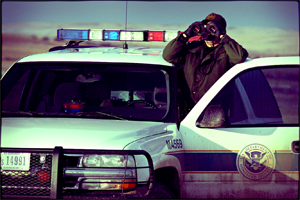 While possibilities always exist, friendly fire is an unlikely scenario under the rules of engagement used by the Border Patrol and what the Border Patrol has said unofficially. Whatever the tragic circumstances of Agent Ivie's death, what is clear is that the serious uptick in drug cartel activity in recent months indicates that Agent Ivie was operating in an environment where failed border and corrupt gun-running policies have created an unsafe, and very serious and spiraling national security concern. It was three of our guys checking a sensor and those [expletive] waited for our guys at the sensor and ambushed them. One had a rifle and the other two had hand guns and opened fire. One dead. I hear it's Agent Ivie and Agent Johnson was shot in the hip and ankle and is in Tucson Hospital. The third agent was not hurt. Sounds like all three [attackers] got away. BORTAC and BORSTAR and entire Douglas and Brian Terry station are out there. They were south, I'm sure, minutes after the shooting. We busted 10 mules with 10 double bundles of drugs last week. Sounds like retaliation. Mexican officials are confirming the arrest of two men in Mexico on Wednesday suspected in the death of a Border Patrol Agent. Reuters reports: "The two suspects detained in Mexico were arrested in a Mexican military operation in the city of Agua Prieta, in Mexico's northern Sonora state, a few miles (km) from the spot where Nicholas Ivie, 30, was shot dead", according to a Mexican Army officer. While the United States certainly appreciates this instance of Mexico's swift cooperation with U.S. authorities, the murder itself indicates that Americans, especially law enforcement agents, are targets for violence by those who believe they no longer have to worry about accountability to the law. If anything, accountability this time was provided by the Mexican government, not the Americans. An ironic twist to the ever-strange relationship between Mexico and the United States. When Mexico has to arrest its own people for murders of U.S. law enforcement, it is sensible to conclude that current border policies are not only producing failure, but tragedies. Illegal border activity has grown increasingly violent and brazen over the past two years, including the notorious murders of rancher Robert Krentz in nearby Douglas (April 2010), Border Patrol Agent Brian Terry northwest of Nogales (December 2010), and now Ivie, all within a few miles of the Mexican border. It is easy to see how a "do little to nothing" border policy emboldens the bullies and thugs that make up much of the current cast of illegal entrants along the border. 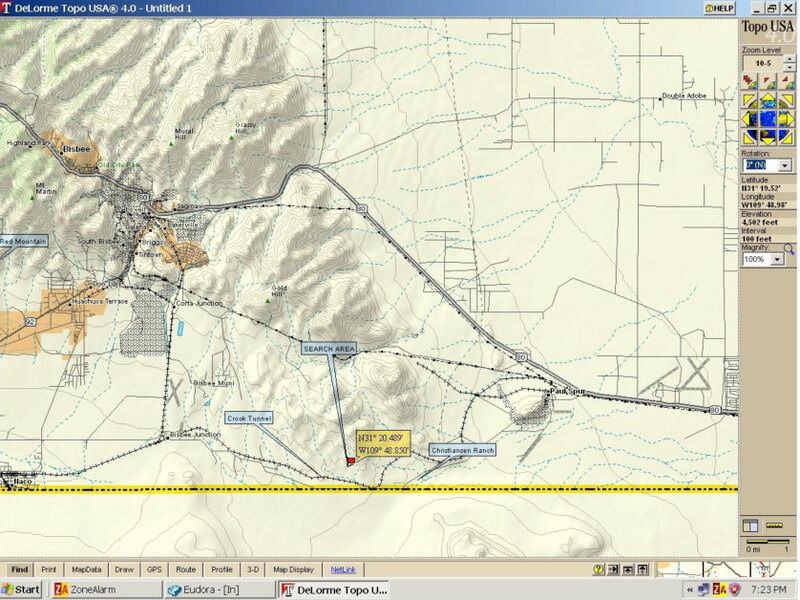 The maps here (click on them for larger versions) show the topography of the Mule Mountains and the location of mile marker 352 on Highway 80 where it is reported Agent Ivie was shot and killed. Note how Highway 80 cuts through and then follows the range southwest toward the Mexican border and Douglas, Ariz., which is located on the far-east corner of where Arizona, New Mexico, and Mexico meet. Mile marker 352 is where flat desert meets unforgiving mountains. This is tough terrain and requires a tough response in infrastructure, technology, personnel, and policy. The map below was provided by Secure Border Intelligence. I received it with the following description: "This is the approximate location of the incident/search area identified from news descriptions, familiarity with the area, and actual GPS coordinates given out by Border Patrol aircraft over VHF radio channels." What we know now is that the red marked area is further south than the incident, indicating that Border Patrol had reason to believe that the assailants fled south toward the border. It turns out, they were right. The "Good Morning America" website has a slideshow of the Ivie investigation that also shows the unforgiving geography of the Arizona border. Most distressing about Agent Ivie's murder is that a standing threat by Mexican cartels to target U.S. law enforcement may finally have been acted on. If the Border Patrol agent quoted at the top of this piece is correct, Ivie's murder was retaliation for the Border Patrol doing its job and we are seeing not just a transferral of drugs from Mexico, but the importation of cartels' hideous tactics of unscrupulous intimidation. Recall that such threats from the Mexican cartels are not new. Two years ago Nogales police, concerned about a spike in murders, including top politicians and police, began stepping up enforcement efforts. The response? Outright threats from the cartels to back down, or off-duty police would be targeted by the cartels. This time, however, there was no known warning. Which bears in mind a critical question: Has a new kind of war been declared on the Border Patrol? And if the Border Patrol is not safe to conduct their duties, does this mean a seed has been planted to create systematic fear on our southern border (which is not that different from what a terrorist organization does to gain a foothold)? Or was this a random event by a bunch of thugs that thought target practice against the Border Patrol was worth a test drive, luring an agent with a sensor hit in difficult terrain in the early hours of the morning where support would be minimal and response difficult? Residents of Naco have been complaining lately that illegal-alien activity is on the rise, according to one former resident organizing a vigil for Agent Ivie. My source told me via e-mail that a border rancher friend in Naco told her: "He has had 21 trucks come through the ranch since February 2012 and believes they were transporting drugs. The Border Patrol caught none of them." My source told me she moved further north in Arizona last year after Mexicans set three diversion fires close to the Arizona border that destroyed 60 homes. The extent to which this murder was pre-mediated, by whom, and for what reason remains unanswerable right now. What is clear is this: The ambush of Nicholas Ivie illustrates how political leadership that protects lawbreakers at the expense of law-abiding citizens and law enforcement officers produces tragic results. The president has muzzled investigations of wrongdoing in Operation Fast and Furious to hide the violence and harm it produced, including the death of agents in the field. Nicholas Ivie's name is now added to the large and growing list of individuals killed on both sides of the border as a result of failed and corrupt policies. The sad fact is the situation on the border can be solved. Such tragedies are due in large part to a government that has turned its back on persons who have given their careers to serve in government on behalf of the American people. But the border can be made secure. It takes a combination of infrastructure, technology, personnel, and policy. The first three are at the fingertips of the president and Congress if they choose to create a secure border. Yet the administration has turned its back on the border in order to enable illegal entry. So now, instead of a secure border, we have a welcome mat to illegal-alien entry with no support for the southwestern states dealing with the drug cartels, which have become increasingly violent inside our borders.